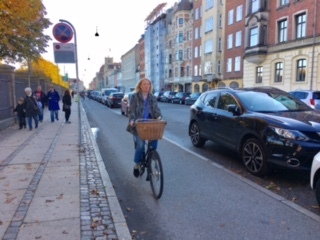 Guest writer Dan Tracy shares his experiences and observations of biking in London and Copenhagen after visiting Europe. Europe is drenched in history, relatives, friends and bikes, at least from my humble perspective. My wife Judy and I spent two weeks in Europe recently, primarily in England, Scotland and Denmark. Among our stops were London, Leicester, Birmingham, Edinburgh and Copenhagen. Judy was born in England and still maintains dual citizenship there and in the United States. Our main goal was to see her family and the sights on the other side of the pond. But I also watched how people got around. Cars still are prominent, but unlike in Metro Orlando — or most of the states — the vast majority of Europeans we saw relied on their feet, mass transit and bicycles as they traveled for work or pleasure. Bikes were very present and hard to miss, particularly during the morning and evening rush hours to and from the office. There are lots of reasons for the difference in the popularity of cycling, including the fact that most European cities are compact and densely populated, making it much easier to walk or bike or catch a bus or train. Central Florida, as anyone who lives here knows only too well, is spread out, with relatively small developments and neighborhoods dotting the area. They typically are connected by wide, busy roads and highways. That makes a car a virtual necessity, especially since buses and the SunRail commuter train offer limited schedules. Two European cities really stood out when it came to biking as we were making our rounds: London and Copenhagen. Administrators in both cities promote biking as a way to ease congestion and the resulting pollution that comes with all those cars idling at traffic lights. Each city also invests in bike infrastructure, with loads of bike lanes painted onto most streets. Copenhagen, however, is much more progressive in its approach, in part because biking is an ingrained part of the culture dating back to the 1800s, when cycling started catching on. This bike path in Copenhagen uses parked cars to shield people biking from traffic. Roughly 37 percent of all commuters in Greater Copenhagen — population about 1.2 million — ride bikes, according to the website Denmark.DK. Nine out of 10 Danes own a bike, compared to only four out of 10 who own a car, the website says. Copenhagen and its surrounding communities are continually building cycle lanes that are more than just a stripe of paint, but actually include physical barriers, such as curbs and even parked cars, between bikers and traffic. Many of the cycle routes also have lights timed to give bikers preference over cars. Biking, it is no surprise, has become a big business. There are 289 bike shops and wholesale dealers in the region. London also encourages biking, starting with the administration of former Mayor Boris Johnson. Thousands of cycles can be rented and picked up from racks scattered throughout the city — just like the bike-share programs in cities throughout the world, including Orlando. There also are hundreds of miles of painted bike lanes, but that’s pretty much where the similarities end with Copenhagen. 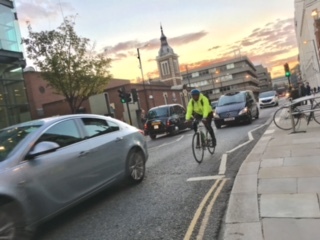 Cyclists in London are much more on their own when it comes to traffic, often sharing lanes with no markings set aside for bikes. This bicyclist joins car traffic while biking in London. Cyclists in London, as a result, are much more aggressive in their riding than in Copenhagen. London bikers often take the lane, especially when waiting for a traffic light to change. Local media reported in late October that seven cyclists had died in London during 2016, six of them after being hit by trucks. New Mayor Sadiq Khan has pledged to triple spending on bike lanes and paths in the city. Some of his campaign literature even showed him riding a bike. Central Florida officials, especially in the city of Orlando, are reworking the road network to accommodate biking. But we still have a long way to go to catch our brethren on the other side of the Atlantic.